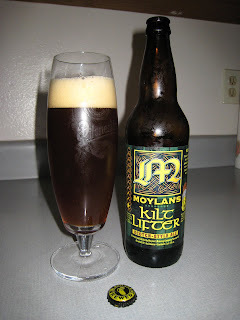 Moylan's definitely labeled this brew correctly. At 8%, this will definitely make all the gals (or guys if that is your thing) a bit looser. That is if they can finish this heathen. It has a nice reddish brown color with a very smooth head. The smell is very sweet and nutty. It is has a fairly malted taste that makes you wonder how you will finish it. This bottle has to be the busiest I have ever seen, and this beer has won a ton of awards. Also, the brewmasters name is Brendan, so +1.